Metallics are so on trend in home décor, one in particular is having their own moment right now and to be honest it comes as no surprise why its cropping up all over the home. Copper is beautiful and brings a fresh new twists to spaces, however rather giving a room a cold and stark feel, the copper creates a warmer aesthetic. The love of the copper hues don't just stop with home décor, lightening, or furniture. Many who love the copper trend are even seeking changes within their kitchenware, accessories and even electrical appliances. 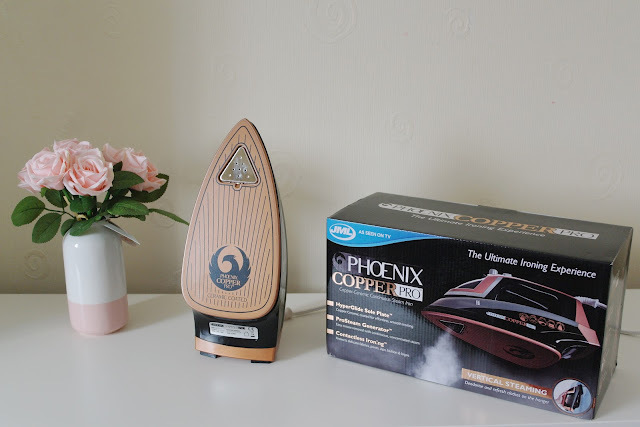 So please let's talk about the Phoenix Copper Pro from JML Direct. 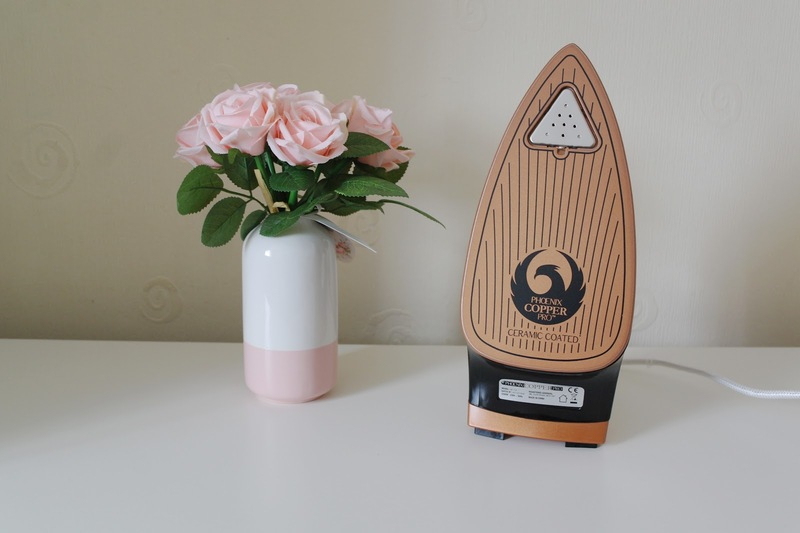 In a nutshell the Phoenix Copper Pro is an innovative way to help create the ultimate ironing experience, that makes every aspect of ironing easier, smoother and quicker. 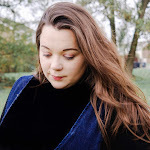 As a new stay a home working mum to one, you could say that my day is rather full of errands, nursery runs, cooking and that's not even mentioning laundry or daily chores. So I am always looking for ways to make my life easier, and I think that the Phoenix Copper Pro will help me do this. Frankly, I don't have the time to spend hours on end ironing uniforms, shirts and bedsheets. Well did I mention that its Copper? Oh I did, well that aside this iron is pretty impressive. 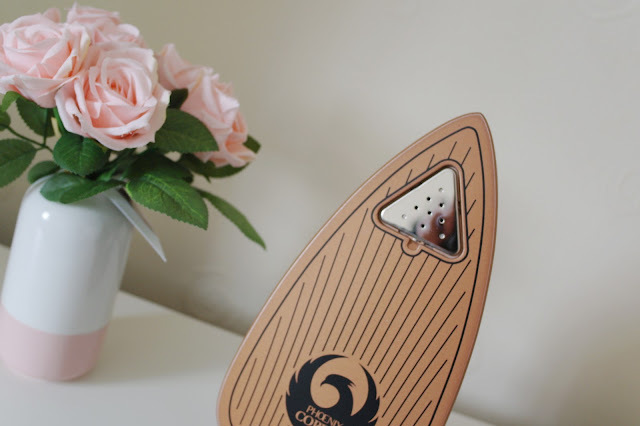 The Phoenix Copper Pro has so many different features that this little iron will sure to make a your life easier. The unique combination of a HyperGlide™ copper ceramic coated soleplates and a built in pro steam generator that gives an unbeatable levels of crease removal with outstanding professional results. They heat up super quick and actually help hold the heat enabling you to use them for a longer period of time, making more time to catch up on Suits. It also features 'The Power Triangle' which sends a powerful intense steam. You could even use this iron as a hand held steamer to ensure you can get to the those hard to reach places or to use on delicate materials. With the first use, the pump driven pro steam generator certainly packed a punch. It did take a second or two to figure out how to stop the continuous steam, but oh my word it is powerful. My nearly five year old iron was trying to hang in there but the steam was near enough a mist and I would end up with more creases. The Phoenix Copper Pro also has an anti calc function which is amazing for eliminating lime scale, as in reality descaling an iron is not really going to be on top of someones to do list. Do I need to mention Suit, season 3? 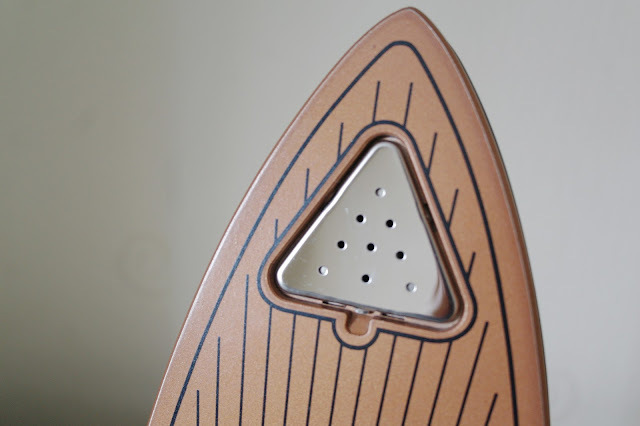 Thankfully this has a removable steel cover plate, over 'The Power Triangle' which makes cleaning quick and easy. The Phoenix Copper Pro certainly packs a punch when it comes to steam, that's for sure. As a busy wife and mum to one, the Phoenix Copper Pro has made my life easier and my ironing experience is so much smoother. My favourite part of this iron is the fact that it has continuous super intense steam, making my weekly ironing fast, de-creases my clothes as we as decrease the time I spend on ironing them. What do you think of the Phoenix Copper Pro? Do you think that it's something that you would try? 28 comments on "Making My Life Easier and Smoother with JML Direct"
Oh dear! That’s not good. Get yourself one of these. I must admit it’s pretty good. Haha it’s such a thing! Ironing is the Bain of my life not gonna lie! If this little gadget works and makes it easier, I’m all for it. Oh I’m not going to lie, I do hate it too. I thought it was super pretty, but it’s also super powerful. I have never seen such a stylish looking iron! I'm amazed at how much I love the look of an iron. I think I would end up not using it. I was a little like that at first. Anything which eases the burden of doing the ironing has to be a good thing! Oh yes, it’s super pretty too! You should definitely get one of these Lucy!